Veeam Agent for Linux creates a snapshot of the volume(s) whose data you want to back up. To create a snapshot, Veeam Agent for Linux uses the Veeam Agent for Linux Driver. The snapshot is created on the volume that has enough free disk space to contain the snapshot data. Veeam Agent for Linux copies to the snapshot data blocks that change on disk during backup. The snapshot helps make sure that the data on the volume is consistent and does not change at the moment of backup. In case of snapshot-less file-level backup, Veeam Agent for Linux does not create a snapshot during the backup process. To learn more, see Snapshot-Less File-Level Backup. During backup of data that resides in the Btrfs file system, Veeam Agent for Linux does not use its driver to create a snapshot. 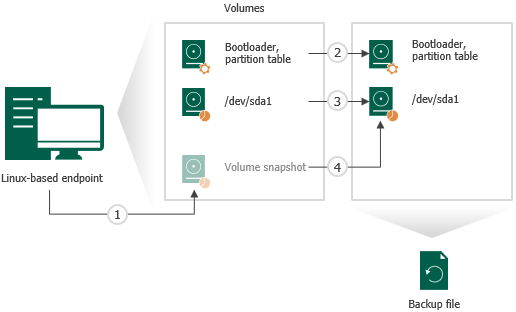 Instead, Veeam Agent for Linux leverages Btrfs capabilities to create a Btrfs snapshot. For volume-level backup, Veeam Agent for Linux copies to the target location the partition table and bootloader located on the hard disk. Veeam Agent for Linux reads data from the volume whose data you want to back up, compresses it and copies it to the target location. For volume-level backup, Veeam Agent for Linux copies data blocks of the whole volume. For file-level backup, Veeam Agent for Linux creates a volume inside the backup file in the target location. The content of the volume in the backup file is synchronized with the volume on the source: Veeam Agent for Linux copies only those data that you have selected to back up. After all backed-up data is transferred to the target location, Veeam Agent for Linux removes the snapshot. In the target location, Veeam Agent for Linux stores copied data to the backup file.